With Complete Home Improvement’s range of security screen doors, say goodbye to intruders forever. Offering an exclusive blend of innovative modern design and up-to-date features, our array of security screen doors represent the next generation in home security solutions. Our security screens are made up of the finest materials that offer durability as well as integrate seamlessly with your home. Complete Home Improvement’s sleek and unique security doors are available in contemporary colours to suit your home decor. We believe in delivering the ultimate peace of mind without compromising your lifestyle. Complete Home Improvement uses advanced technology to design the security screen doors so that you can get the best of both the worlds – great sturdiness and attractive looks! Our premium range of security screen doors looks excellent on any Australian home, providing a wonderful airy feeling inside, along with complete serenity to open the doors anytime without the fear of being burgled. We stock an array of quality sliding and aluminium security doors, so if you want to customise your security door, we can help you by providing the perfect security solution for your home. Sliding and hinged security screen doors are growing more popular in today’s new and renovated Australian homes. Hence, to walk with the trend, our excellent array of sliding and hinged security screen doors is patterned keeping in mind the demands as well as the needs of the Aussies. Complete Home Improvement offers varied hinged and sliding security screen door options without compromising the vision through the door. 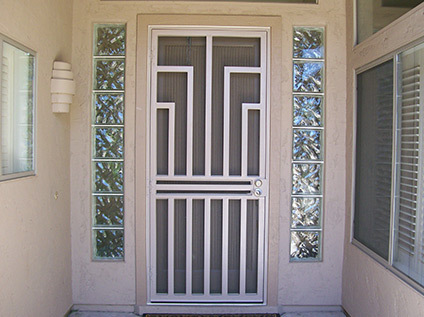 Are you looking for a sturdy security door for your home? Our best, reliable and affordable aluminium security screen doors are within your easy reach. At Complete Home Improvement, our standard range of hinged-aluminium security screen doors will help you get the best security. From utility doors to the front doors, hinged aluminium security doors are the ideal choice to safeguard your premises. Our aluminium doors are designed and patterned keeping in mind the latest technology. If you’re searching for a safe, secured yet a stylish security screen door in Sydney, call Complete Home Improvement on 1300 912 293. Alternatively, you can email us on sales@completehomeimprovement.com.au to ask any questions about our varied range of security screen doors.